It’s the day that U.S. retailers finally turn a profit for the year, and their ledger books are officially “in the black.” Black Friday is the ultimate celebration of capitalism. A bacchanalian feast of doorbuster deals on electronics, home goods, toys and anything else you can stuff under (or beside) a Christmas tree. This undeniably American holiday has even spilled over into Thanksgiving, with many of you likely staying out late last night to stand in line for a supremely discounted TV, gaming system or some other must-have holiday gift. Personally, I’m at home in my flannels — and have probably been so since Thanksgiving morning. I’ll be waking up late following a cocktail of Cincinnati craft beer, turkey with all the fixin’s, and excellent conversation and games with family. I don’t stand in line for doorbuster deals. I don’t brave the throngs of people rushing into Walmart, Best Buy and the local malls. I don’t have to lay down the back seats of the family minivan to accommodate a wealth of gift-wrapped packages. Thanks to Amazon.com Inc. (Nasdaq: AMZN), I can do all my holiday shopping in my pajamas while eating leftovers and drinking a holiday stout. Like many investors, I have a bit of a love-hate relationship with Amazon. The company has a habit of overspending and eating into earnings — thus negatively impacting AMZN’s stock price. In my last serious look at Amazon, I argued that the company’s heavy spending ways would return and undermine AMZN stock investments. I have to say, Amazon proved me wrong with its last quarterly earnings report. Earnings and revenue both rose, as the company finally appeared to have struck a balance between massive spending and sales. And while I’m not yet ready to concede the grocery market to Amazon and its acquisition of Whole Foods Market, the company has some solid prospects there if it can get delivery and online ordering right. 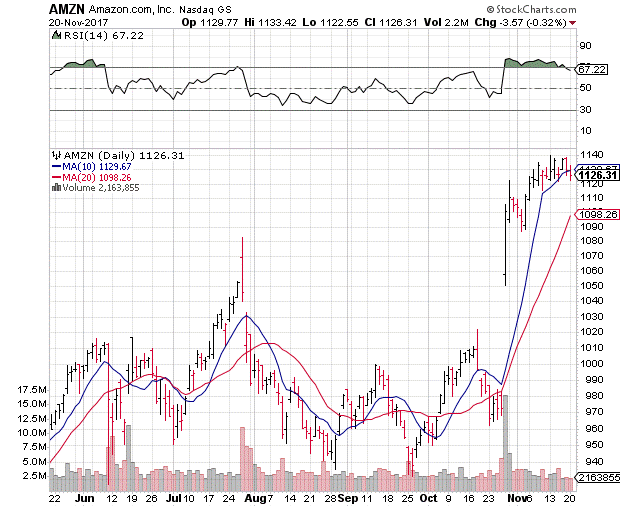 Putting the grocery market aside, there are two major reasons to hold AMZN stock long term. The first comes down to what I and many other holiday shoppers are doing today (and will continue to do through Cyber Monday): shop from the comfort of our own homes while avoiding the insanity that is Black Friday and the holiday shopping season. Personally, I cannot stress the importance of this convenience enough. Will there be better deals at my local Best Buy or Walmart? Maybe. Are they worth dealing with holiday shoppers, holiday traffic and everything that goes along with them? Not for me, or for many other holiday shoppers cozied up in their homes basking in the glow of their tablets or laptop PCs. The second reason to be bullish long term on AMZN stock is the company’s potential gains from the cord-cutting movement. Amazon has emerged as one of the new “Big Three” in American entertainment, joining Netflix Inc. (Nasdaq: NFLX) in toppling the old guard of broadcast television and cutting deeply into the pocketbooks of pay-TV purveyors like Comcast, AT&T and Walt Disney. Amazon is spending $4.5 billion this year on original content, and has firmly solidified its spot as the No. 2 option for online streaming entertainment. The earnings-driven rally has taken AMZN into all-time-high territory, and the shares are hovering near overbought levels as a result. AMZN stock has outstripped its 50- and 200-day moving averages, while its short-term 10- and 20-day trendlines are only just now catching up. The conundrum for those investors looking to add AMZN to their portfolios is that there is still some consolidation and short-term downside risk to work off, even as Amazon heads into the holiday shopping season. However, any pullback should be a buying opportunity. One way to make sure you don’t overpay for AMZN stock is to follow my colleague Chad Shoop’s strategy of using a put sell position to essentially name your price. By selling a put option at the price you wish to pay for Amazon shares — I’d likely set a target near $1,115 or $1,120 — you can collect the option premium, and sit back and wait for AMZN to trade in your target range. In the meantime, I hope you are enjoying your Thanksgiving holiday. I’ll leave you with this entertaining article from IndyStar that lists a few choice 1-star reviews for some of Amazon’s hottest Black Friday deals. Editor’s Note: As great as the gains in tech stocks like AMZN have been, Real Wealth Strategist Editor Matt Badiali has found a company in the natural resources sector that could make you much more money — even giving you the chance to turn every $1,000 invested into a $31,130 windfall. If this company does only half of what Matt is expecting, it will make you incredibly wealthy. But before you get carried away imagining what you’d do with that much money, click here now to learn Matt’s investing secret — the very secret he used to help his readers make 2,178% in gains. Housing Market Growth Just Keeps Going. Who Will Benefit?